Before any deck of cards is put into a game, it’s always a good idea to verify it first. Verifying a new deck of brand new cards is done to ensure that the deck was manufactured correctly and to catch any production errors before they have a chance to affect your game. Verifying a used deck of cards is done to ensure that no cards have gotten lost and that the cards have not been damaged or marked by players seeking an advantage. Verifying a deck of cards that has never been played with before is simple. First, remove the packaging and spread the deck on the table, face up. New cards are always supplied with the cards in sequence, so it is easy to see if there are any cards missing or any duplicates. 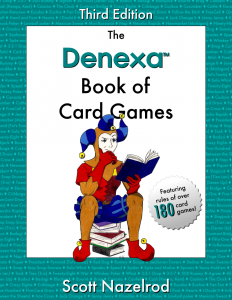 (Before Denexa was founded, one of us purchased a deck from a competitor, and because we didn’t verify the deck first, we didn’t realize until midway through a game that the deck had been shipped with two copies of the 2♦.) Check for any printing errors as well. Then, collect the cards and spread them face down. Now, check the backs, looking for any printing errors that will cause the card to be identifiable in play. 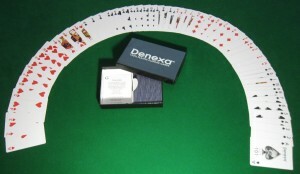 Verifying previously-used decks of cards follows a similar procedure. However, you will need to sort the deck back into sequence to ensure that all cards are present. We recommend doing this after your game breaks, before you put the cards back in the box; this allows you to check the play area for any missing cards. 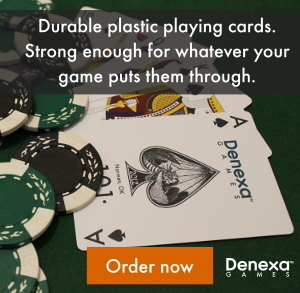 Denexa Games stands behind its products, and we do our best to ensure that your cards won’t have any of these issues. However, should you run across a defect, we will be happy to send you replacement cards. A Guarantee Card is included in each deck with instructions on how to contact us in this situation.